Apache Mahout is a “scalable machine learning library” which, among others, contains implementations of various single-node and distributed recommendation algorithms. In my last blog post, I described how to implement an on-line recommender system processing data on a single node. What if the data is too large to fit into memory (>100M preference data points)? Then we have no choice but to take a look at Mahout’s distributed recommenders implementation! The distributed recommender is based on Apache Hadoop; it’s a job which takes as input a list of user preferences, computes an item co-occurence matrix, and outputs top-K recommendations for each user. For an introductory blog on how this works and how to run it locally, see for example this blog post. 1. Download lucene-4.3.0.tgz (e.g. from here) and upload it into a S3 bucket; make the file public. 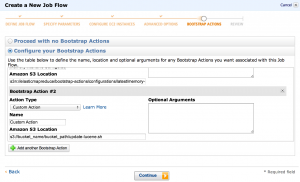 This script will be run on the Hadoop nodes and will update the Lucene version. Make sure to change the script and enter the correct bucket name and bucket path so that it points to the public Lucene archive. 4. Finally, we need to upload the input data into S3. Output data will be saved on S3 as well. 5. Now we can start setting up the EMR job flow. 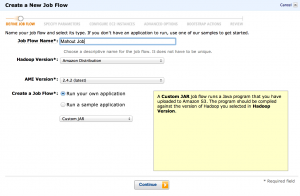 Go to the EMR page on Amazon’s console, and start creating a new job flow. 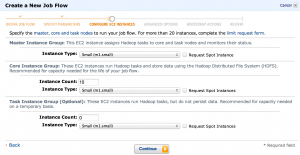 We’ll be using the “Amazon Distribution” Hadoop version and using a “Custom JAR” as the job type. That’s also the place to specify where the input data on S3 is, and where output should be written. 7. Then we can choose how many machines we want to use. This depends of course on the size of the input data and how fast you want the results. The main thing to change here is the “core instance group” count. Two is a reasonable default for testing. 8. We can leave the advanced options as-is. And that’s it! You can now create and run the job flow, and after a couple of minutes/hours/days you’ll have the results waiting on S3.